Raises a certain stat by two stages depending on the Pokemons type. Both RaZoRs' and Magnus' ideas look good btw. So, remember that I won't be able to update that page until the 6th of January. I'll still talk and contribute here though. I got an idea every generation has its dark pokemon right? The concept is an ice ghost pokemon with a name which somehow links to the word or another similar word. My friends an I fight for good beware of warbot the humanrobot!! If its not JB its not right! warbot1000 wrote: I got an idea every generation has its dark pokemon right? I don't think we're focusing so much on legendaries or pseudos yet, but it's an idea. But it really belongs in the other thread, as this one is for developing Pokemon we've already agreed on. But to be perfectly honest, you've just described Froslass. Even it's sun/mon pokedex entries. 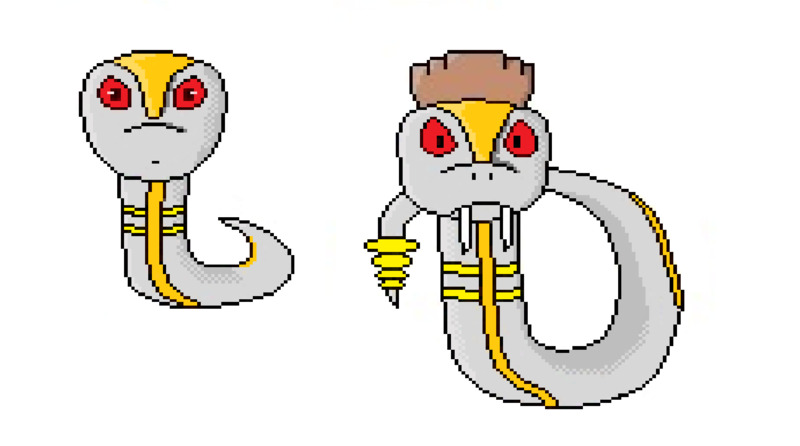 I did some pixel art on the sneks. I used paint because I don't have anything else, and it suddenly ruined all the colors. I left the crown unchanged because I got sick of shading, so that's why it's so spotty. I'm not sure if the shading is good, it's the first time I used this 'technique', if you can call it that. I think it's better than the drawing at least. Because that's a link to a webpage, not a link to an image. Try looking at the style of how pokes like Seviper, Ekans, Arbok, etc. are done and try to emulate that. I'll add Nyvern, Conglomode, Werkabug, Termight, and Isopterra to the OP. Can I suggest maybe changing the types of the Scorpion, away from another Ground type? Maybe pure Poison and then Poison/Rock or Poison/Something else? RaZoR LeAf wrote: Can I suggest maybe changing the types of the Scorpion, away from another Ground type? Maybe pure Poison and then Poison/Rock or Poison/Something else? I would be up for a type change, but not to Bug, since we also have a lot of Bugs. Anyway, the page should be finally updated, and with it, some holes of course. Namely, pokedex entries and stats. We also should work on the genie concept. AerisDraco wrote: I would be up for a type change, but not to Bug, since we also have a lot of Bugs. The urge to keep the stats at multiples of 5 was strong.